The Representative clearly was relishing his role as Zen Master of chaotic convergence. The third act of the set saw the artist sit behind the drum kit. The ensemble out front jammed and free associated while the man himself proved a capable –albeit idiosyncratic -skin beater. After the concert, The Muse Patrol had the opportunity to speak with multi-instrumentalist Kris Bernard. She was a member of Jandek’s ad-hoc ensemble convened exclusively for the L.A. performance. She played bass and drums. Her back story is nearly as compelling as the performance itself. Kris had never performed on stage before May 24, 2014, and even more remarkable, had no prior musical training or experience on any instrument at the time of her induction into the group. 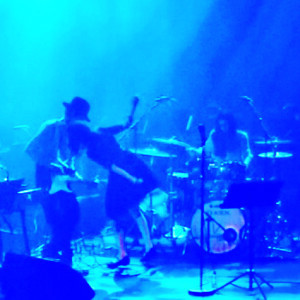 The Muse Patrol (TMP): Before the gig, were you familiar with Jandek’s music? (TMP): What was the tweet? (TMP): Which record was it? (TMP): How were you contacted for the gig? 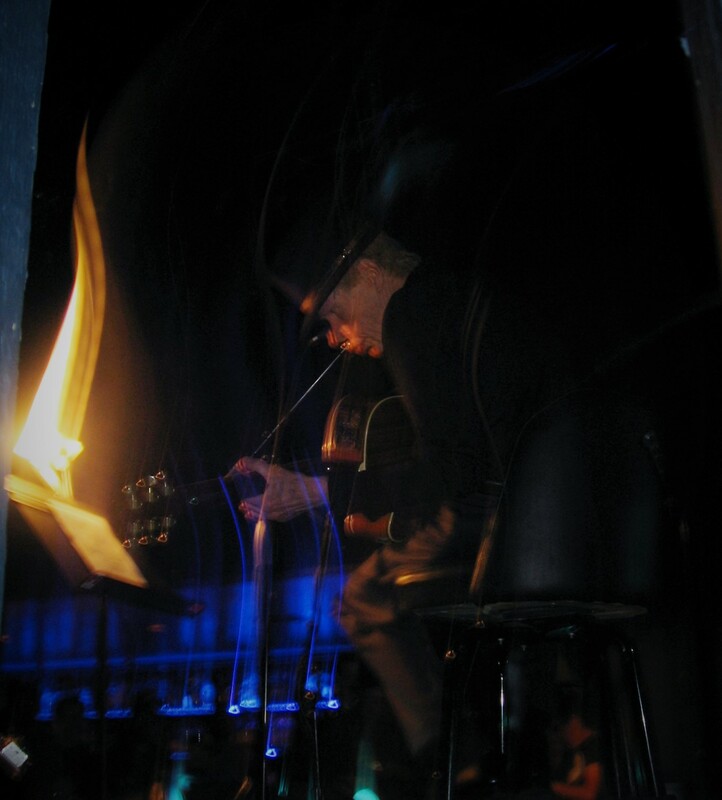 (TMP): Had you ever had any musical experience before you got up onstage with Jandek? (TMP) Remarkable, I would not have known you had zero experience as a musician. (TMP) When you told Corwood that you had no musical experience, it didn’t matter? (TMP): What do you do? (TMP): As far as preparation, was there any rehearsal at all? (TMP): No keys or riffs or anything like that? (TMB): You mentioned your boyfriend, was he in the band at all? (TMB): As regards free form music, it takes a certain fearlessness to stare down 300 people packed into a club. A lot of trained musicians won’t do it. Was there apprehension? Did you have to slam down a couple of Tequilas? (TMP): I don’t want to get tabloid, but with Sheila onstage, there was a lot of sexual energy or interplay with The Representative. Was that shtick, or was there something going on? (TMP): So you never met Sheila before the gig? 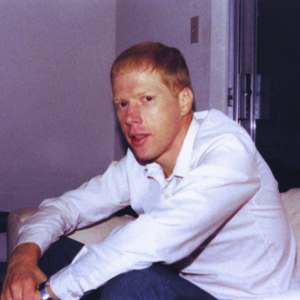 (TMP): Do you think you’ll ever meet Jandek again? (TMP): I want to get to the soul of the man. But I’m as interested as anybody else in preserving the mystique. Did he introduce himself to you as anybody? (TMP): I’ve heard he is well spoken. (TMP): After the gig did you toast each other or say ‘Nice Job’ or anything? (TMP) Did anyone mention that this show would be released on CD or DVD? Was it filmed? (TMP): Now that this has happened, do you have any plans to pursue music?